If you like the classic combo of peanut butter and chocolate, then take it from me: these brownies can serve it up. They've got your sweet, your salty, your chocolate and your peanut butter plus a healthy dose of pretzel-loaded crunch. 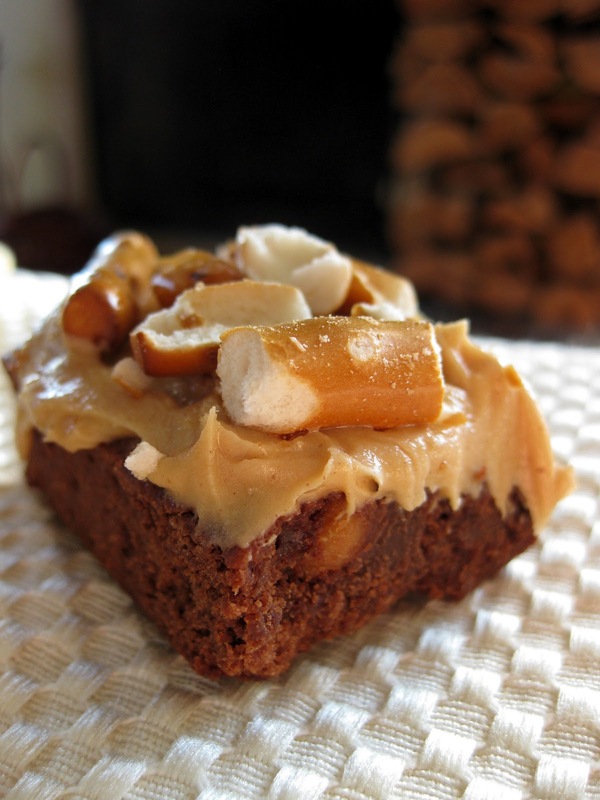 One thing they really get right is a strong peanut butter brownie base that's good enough to stand on its own. I can't take the culinary credit here; My friend whipped up a few batches. But I ate them and thoroughly approved! And let me tell you, I've tried a few peanut-butter brownies in my time. 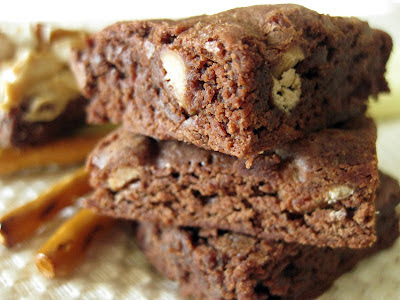 These are the first worth sharing, though they don't conclude my search for great peanut butter brownie recipes. Enjoy the recipe below! Even without frosting and pretzels, these brownies can stand on their own. 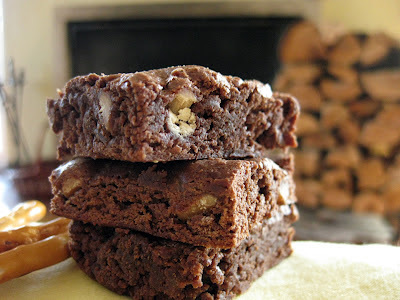 Make the brownies in advance, fully cool and refrigerate them before frosting. Preheat the oven to 350 F. Line the bottom of a large baking sheet that has sides (i.e. jelly roll pan) with parchment paper, cutting to size, and grease the top of the parchment paper. Sift the flour, salt, and cocoa powder together in a medium bowl. Place the chopped chocolate and butter in a double boiler or a small heat-proof bowl set over a pot of simmering water to melt, stirring occasionally. Once melted, turn off the heat but keep in place over the burner and whisk in both sugars until fully combined. Remove from heat and allow to cool slightly. Add 3 eggs to the cooled chocolate mixture and whisk until just combined. Whisk in the remaining 2 eggs. Add the vanilla and flour-dusted peanut butter chips and mix gently. Slowly add the flour mixture and fold it gently into the batter using a spatula until just combined. Pour the batter into the pan and spread to the corners and sides with a spatula. Place in the oven and bake ~30 minutes or until a toothpick inserted in the middle comes out mostly clean. Remove from the oven and let cool on the counter. Cover and refrigerate overnight or until fully cooled. Once they've cooled, use the parchment paper to remove them from the baking sheet and carefully remove the parchment paper. 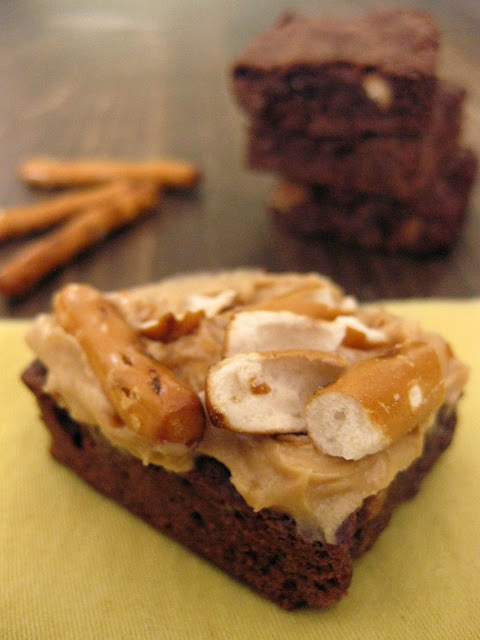 Once the frosting is ready, frost the brownie slab and sprinkle with crushed pretzels, then cut into brownie-sized quadrilaterals of your preferred dimensions. Place the powdered sugar, peanut butter, vanilla extract, and salt into a stand mixer with a paddle attachment and combine at medium-low speed, scraping down the bowl with a spatula as needed. Add the heavy cream and gradually increase the speed to high; continue until smooth.